Pocahontas (population 727) is located on Interstate Highway 70 and U.S. Route 40 about 40 miles northeast of East St. Louis. This places Pocahontas in the southwest corner of Bond County. The Conrail Railroad and a branch of the Shoal Creek both run through town. The history of the town and its school system are in need of research. "I grew up in Pocahontas but missed by 2 years in attending Pocahontas High School . 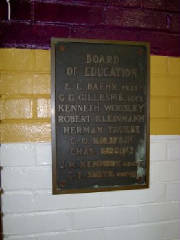 I attended school in Pocahontas from the 1st thru 8th grades in the original school building and current gym. In 1958 I started high school in Greenville (Bond County Community Unit District #2 High School), graduating in 1962. Both of my parents graduated from PHS. My father, in fact, played basketball for Joe Lucco while he coached there. Joe Lucco’s home town was Pocahontas. As a child it was always exciting attending basketball games on Friday nights. The last year for Pocahontas High School was 1956 when Bond County Community Unit District #2 was formed and the schools of Pocahontas, Sorento, and Greenville (and maybe Reno ) attended the new Bond County Community Unit District #2 High School (known of course as Greenville High School ). 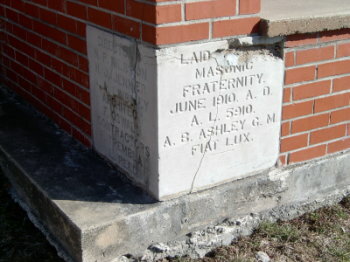 The school building at Pocahontas was torn down and the grade school built on its location – I do not know the date. 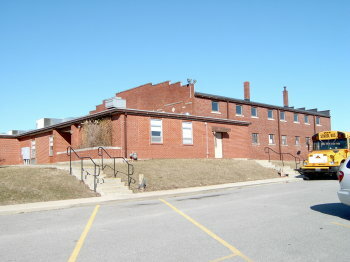 The high school gym (which at that time also consisted of the band room, ag room and cafeteria) was left intact and is now used by the grade school. Part of the new school was built in front of, and is connected to, the gym." 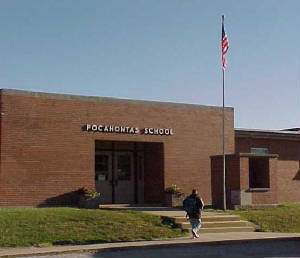 The Pocahontas Center Grade School building is pictured above. The picture was found on the school web site : http://www.bccu2.k12.il.us/pes/homepage.html . 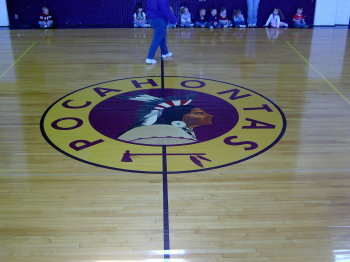 Pocahontas High School (c'mon, they HAD to be the "Indians"!) definately offered boys basketball. Track and baseball may have also been offered to the boys. We have VERY limited information available. We are hopeful a Pocahontas resident or former alumnus can help us out. 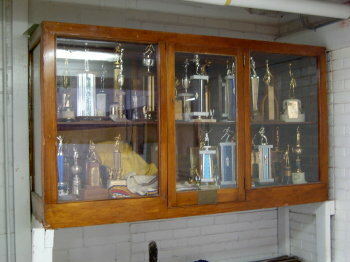 According to the IHSA web site (www.ihsa.org) the Pocahontas High School boys basketball team brought home two District titles during their existence. The team records and coach's names were not available. If you have information on these two teams as well as other Pocahontas High School accomplishments please e-mail us the information so we can share it with others. "I haven’t been in the gym for several years but originally the benches and scoring table were located on the stage. The stage was on the west side of the court and was about 4’ above the floor. After timeouts, the substitute players always had to help their Coach get back to the bench on the stage. The wooded bleachers only on the east side began about 4’ above the floor and consisted of 8 to 10 rows. The floor was very near the walls with only about 1’ between the out of bounds line and the wall." What a great atmosphere it must have been to play at old PHS! Some of the scores listed below were found on a website titled "Illinois Postseason Basketball Scores". 1922-23 Postseason scores, record, and coach's name needed. Industry lost in 2nd Rd. 1925-26 Postseason scores, record, and coach's name needed. HIGHLAND (84): B. Tuffli 24, Ward 23, H. Tuffli 17, Byrne 11, Loyet 4, Williams 2, Ginter 2, Zobrist 1. POCAHONTAS (51): Schollinger 12, Romy 12, Hutchinson 8, McCassland 7, Sugg 7, Haberer 3, Kinberlin 2. **Final basketball game for Pocahontas High School. One of the top 50 winningest coaches in the state of Illinois, Joe Lucco, started his coaching career at Pocahontas High School. After stints at Kincaid and Edwardsville, Lucco had a career record of 562-267. *Collinsville High sits at #2 behind Centralia as the winningest team in IHSA history with 1,939 wins after the 2006-2007 season. Principal: Mr. James Kesner. Principal/coach/History teacher/co-sponsor of Sr. class. *Delores Albert won the title as Pocahontas Queen that year. Senior Play for Class of 1954 "Gown of Glory"
Senior "skip-hike" to Washington D. C., New York City and Niagara Falls. 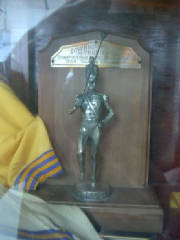 Sports in the 1953-54 school year were boys baseball and basketball. NOTE: Despite showing a picture of the baseball team, no schedule or results were printed.